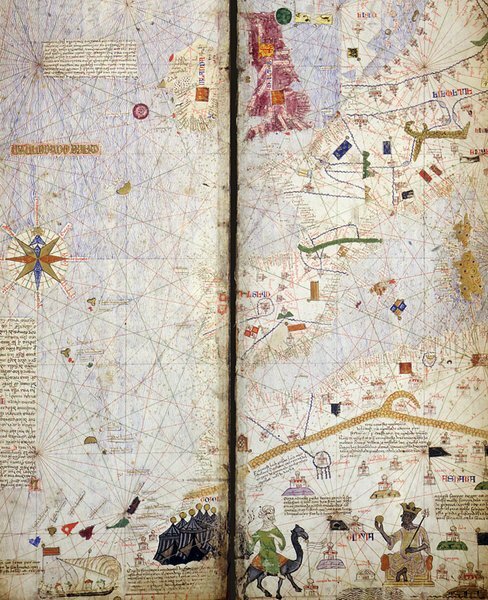 Cresques Abraham of the cartographic school on Majorca drew the atlas catalan, a world atlas. It was drawn in 1375 and it was the first time that a map used a compass rose. Completely unfolded the atlas is 65cm high (2 feet) and 3m long (10 feet). It does not only contain maps with miscellaneous figures and motives but also instructions for navigation, calendars and interpreting star constellations. The French national library has an original of this atlas. The central motive of the atlas' calendar wheel is the geocentric world of Ptolemy. In the center an astronomer with a quadrant and the four elements earth, water, air and fire (Terra, Aigua, Aær, Foch). Further shown the orbits of the seven known celestial bodies moon, mercury, venus, sun, mars, saturn and jupiter (Luna, Mærcuri, Vænus, Sol, Març, Saturnus, Louis). The next ring shows for each of the bodies a figure and text about positions and appearance of the bodies. The follwoing ring shows the 12 signs of the zodiac and a ring with the various moon phases. The level of detail provided by the original is to high to be placed onto a small metal disc. In order to at least capture the essence of the original design, the Mapamundi XXL Geocoin has a diameter of 9cm. 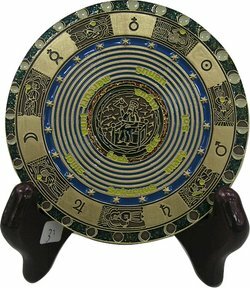 The rings with the planets and zodiacs are distributed onto the front and back side. The back side has the compass rose in its center, shown in the way as drawn onto the original map. 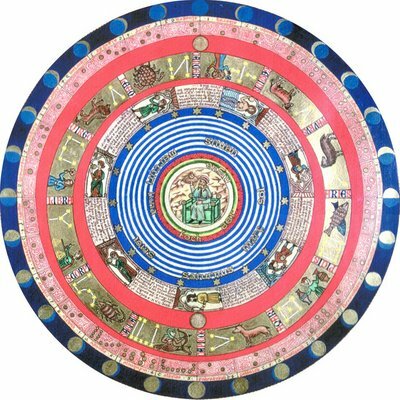 A smaller version of the Mapamundi Geocoin skips the rings with planets and zodiacs and does not use color. This version has a diameter of about 3cm and has an antique bronze finish. 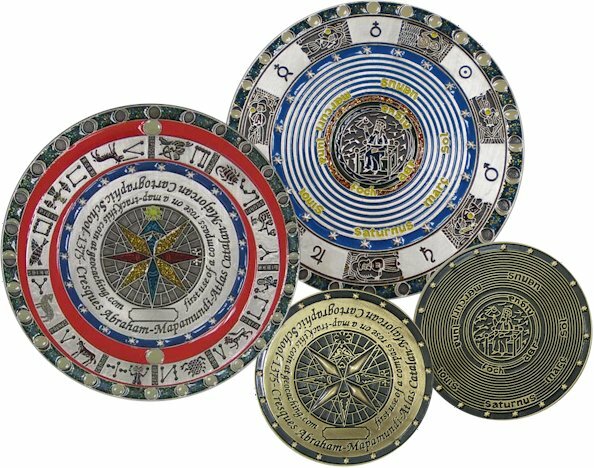 The smallest are the MMM - MicroMapaMundi versions, they have a diameter of only 18mm (0.7 inch) and are available in mat gold and silver antique. They are among the smallest and most affordable Geocoins around. All versions have an individual Geocaching "tracking code" and are trackable at www.geocaching.com/track. The Mapamundi XXL Geocoin is produced in various versions. The onee with an antique silver finish and coloring and the ones in mat gold with glow-in-the-dark coloring are each limited to 100 pieces. Other versions are with a bronze finish, one is using coloring and one without. In addition there is the "Dark Night" version in black, with bright colors and glow-in-the-dark moons.